« My Bike Backfires During De-Acceleration After I Installed Aftermarket Exhaust. Can The backfiring Be Minimized Or Eliminated? Harley Touring Performance Upgrade. The Kraus ST Inverted Front End. Published by Cyril Huze April 14th, 2016	in Customs, Editorial and Suspension. 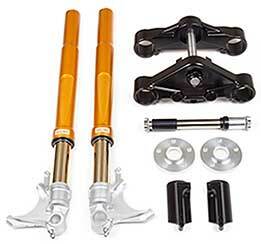 Suspension is one of the most important performance upgrades that can be made to a Harley. The improvements in stability, traction control and brake-dive directly affect handleability and translate to rider enjoyment and safety. 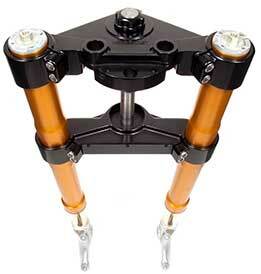 Front forks on a motorcycle need to be as rigid as possible to function as effective suspension parts. They also need to be as light as possible. Satya Kraus of Kraus Motor co. explains: “Most of the stress applied to forks occurs just below the bottom triple tree. When you pull the brake lever you are “braking the wheel” and the bike slows because the front wheel is attached to the front suspension. The momentum of the bike transmits through the forks, trying to push the front wheel. An inherent advantage of inverted forks is their weight, they’re lighter than conventional front ends. A steel fork tube is the heaviest part of a traditional fork assembly. Kraus ST Inverted Front End Kits are designed to bolt up with no drama to FLH/FLT models, allowing the ability to run factory/ stock wheels, and bodywork if desired. Any qualified technician can easily install Kraus suspension products. They come complete down to every single last nut, bolt and washer. These kits are direct bolt-on fitment for all 2000 – 2015 Harley Davidson Touring Models: FLHR Road King, FLHT Electra Glide, FLTR Road Glide and FLHX Street Glide. May fit other models and custom applications. Contact Kraus Motor Co. at 707 595-0950 for more information. Yep, good explanation about the advantage of inverted forks. Why Harley doesn’t do it? Isn’t it refreshing to see a bagger that is made to ride better, with improved suspension and other performance parts and not the opposite, which we’ve been seeing for the last who knows how many years. I’m so tired of unrideable 30″ big wheel bar hoppers, this is like a breath of fresh air! That’s some serious swingarm there too…nice..Brock you paying attention ? Gigacycle’s Corsair INverte3d front end kit for FXR (and I think soon baggers) is so much better than this Kraus kit. It is an unbelievable piece of engineering and a veritable bargain for what it entails. I have no financial ties to Gigacycles, I’ve just seen one up close and it blows my mind…finally someone solved the inverted front end on an FXR and does it better than this better marketed setup. Go Gigacycles, you won’t regret it. I just visited the beautiful Santa Rosa, CA area the beginning of this week also… for a bit of a brainstorming session. Look for some really cool things in the near future. Big aluminum swing-arm, sure there are not stock shocks under the bags, looks like 17″ wheels too. 1st Bagger I like…. add a motor and gearbox and you would have something…. @Chuck – Gigacycles euphemistically refers to their fork leg assemblies and brake calipers as “seasoned” which translates into parts pulled off wreaked bikes and re-manufactured to fit new applications. No thanks. 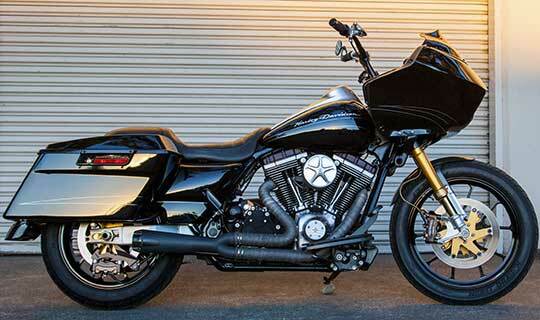 Agreed, nice too see a built to ride hard bagger instead of these clown bikes with 30″ wheels. There are too many loud, slow Harleys on the road. This is what a Harley should be. But there is that little thing called COST !! !